Home equity loans are growing in prominence in Canada and are one of several ways that Canadians have been taking advantage of low interest rates and rising house prices. But what are they doing with the money? This post explores the most common uses for home equity loans. To that end, we will leverage our own experience, industry insights, and third-party data. How Much Money Are We Taking Out? Rising debt levels continue to be a point of concern for policy makers. A closer look at the data, however, reveals a much safer picture than newspaper headlines might elude to. It's true that Canadians are taking money out of their homes, but that money is being used to improve their financial stability by reducing higher interest rate debt and stimulate the economy by funding renovations, investments and retail purchases. Data from CAAMP is extremely useful in this scenario, but we would like throw our hat into the ring as well to highlight some common uses that can be overlooked. Debt consolidation is certainly the most common use for home equity loans in Canada in our experience. Loans backed by residential equity carry significantly lower interest rates compared to other debt vehicles, allowing homeowners to pay down their debt significantly faster without increasing their monthly payments. If you are curious how debt consolidation works, just click here. Canadians are taking money out of their homes only to put it back in. That being said, the renovation industry is by no means dependent on borrowed funds. In fact, of the $68 billion spent on home renovation and home repair in Canada in the last 12 months, only about one-fifth was borrowed. Carefully planned renovations can significantly raise the value of a home, improving your loan-to-value ratio (even after the renovation expense) and allowing the borrower to move their debt to an even lower interest rate. Ever-tighter lending restrictions passed down by OSFI have made it increasingly difficult for self-employed persons, which make up more than one-seventh of Canada's workforce. Home equity loans are an increasingly common way for self-employed individuals to buy a home in Canada. Equity takeouts for investment purposes account for a little over one-seventh of the total equity take-outs. Home equity loans are a great way to finance a business investment or pay back a business loan and shore up your finances. This is surprisingly common. Typically, banks (A-lenders such as BMO) will not lend mortgage funds (for a new purchase or a re-finance) while the borrower owes back taxes. This is the case even if the borrower has the equity in their home to pay off the taxes. As such, a common use for home equity loans is a short term loan that essentially pulls equity out of the home, pays off CRA, then transfers the debt back to an A-lender. 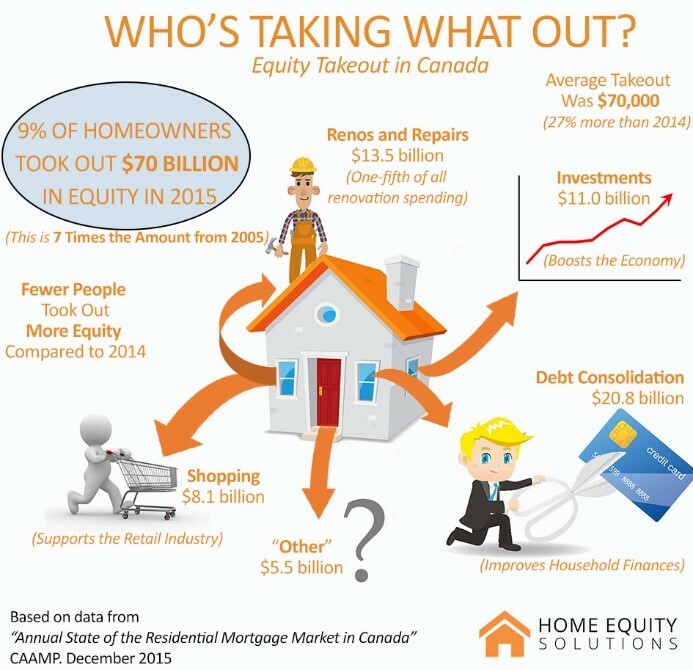 Home equity loans help many Canadian complete their homes. Even if you ignore the obvious emotional turmoil, these are always tricky situations. Home equity loans are very common in Canada and their uses are myriad. Their flexible nature is their strength and there are solutions for most persons in most situations. If you have any questions about how home equity loans can help you, just give us a call or send us an email.